My last two posts looked at two strains of value investing. In the first, passive screening, you look for mismatched companies that trade at low prices, while not being burdened with high risk, low growth or low quality growth. In the second, contrarian investing, you focus on companies whose stock prices have gone down the most, on the assumption that markets overreact to news and consequently have to adjust. While both approaches are backed up by empirical evidence, you still face a problem as. Without a catalyst in the market, causing the stock price to move to what you think is a "fair value", you can be right in your assessment of value, and go bankrupt being right. In activist value investing, you remedy that problem by acting as the agent of change in the companies you target, and thus have a bigger say in your investing destiny. To structure the discussion of activist value investing, let me begin be offering three measures of value for a publicly traded company: The first and most observable measure is the market price of the stock and the resultant market value of the company, set by demand and supply, and driven by the moods, perceptions and expectations of investors. The second is what I will term "status quo value", reflecting the intrinsic value of the company, run by its existing management team, with all of its strengths and weaknesses. The third is the "optimal value", capturing the intrinsic value of the same company, run by the "best" possible management team. To the extent that a firm is not being optimally run (and what firm ever is? ), the optimal value will be higher than the intrinsic value. Unlike the market value, both the status quo and optimal value will require you to make subjective judgments and estimates, with all of the noise that comes with that process. While there are multiple factors that go into determining this probability, including the composition of stockholders, insider holdings and the existence of multiple share classes (with different voting rights), it is a convenient shorthand for the quality of corporate governance of the firm; good corporate governance should translate, other things remaining equal, into a higher probability of management change. Both passive and contrarian value investing are focused on finding stocks that have a pricing gap, i.e., trade at a market price less than the expected value, though some strands of contrarian investing incorporate expectations of control changing (and the resulting increase in value). In contrast, activist value investing attempts to provide catalysts to close both the pricing gap and the value gap, by changing the probability of management change at companies (and thus increasing the expected value of the company) and getting the market to recognize its mistakes in pricing the stock. In summary, there are three pathways to value creation. - Generate more cash flows from existing assets : You can manage your existing assets more efficiently and generate higher cash flows from those assets. To the extent that cost cutting and more efficient operations are not buzz words, this is the place where you will see the results. 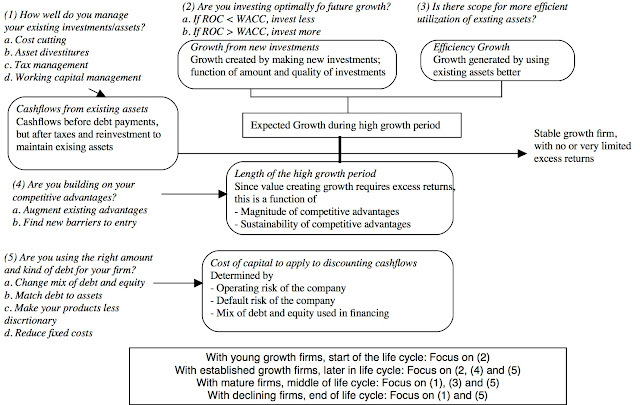 - More valuable growth: Since it is not growth, per se, that creates value, but growth with excess returns, a firm that is pursuing value destructive growth (by investing in assets that earn less than the cost of capital) can increase value by reinvesting less, whereas a firm that has lucrative investment opportunities (earn more than the cost of capital) can increase value by reinvesting more. The choices made on this dimension will affect dividend policy, since less (more) reinvestment will translate into more (less) cash available for return to stockholders. - Cost of funding: To the extent a firm can reduce its cost of capital by changing its financial mix (debt and equity), altering the debt it carries to better match its assets or reduces it operating risk can reduce cost of capital and increase value. If you are interested, I have an extended discussion of the expected value of control in this paper. I also have a simple spreadsheet that you can use to assess the status quo and optimal values for a firm. I have entered the numbers for Kraft Foods in here, and based on my assessments, Kraft Foods has a status quo value of $59 billion and an optimal value of $ 65 billion, leading to a value of control of about $ 6 billion. For an activist value investor to be a catalyst for value change, he or she has to first identify a firm that is poorly managed, relative to it's potential, and then has to follow up by figuring out what aspect of value creation offers the most promise in the identified firm. Cookbook restructuring, where the same remedy (borrow money, divest asset, pay dividends) is employed for every "troubled" firm, can easily destroy value at some firms. Finally, the investor has to try to alter the probability of management change. At the extreme, this can take the form of a "hostile acquisition", where the activist investor accumulates a majority stake in the company and puts in place a new management team. It can also take lesser forms, including proxy fights and forming coalitions with other investors to change the composition of the board of directors. a. Wrong side of momentum: As I have noted in earlier posts, market momentum can be a strong force, pushing prices away from fair value over extended periods. Thus, a stock that has fallen out of favor may see its stock price get pushed down well below its status quo value, as investors flee, and one that is in favor can see its stock price increase increase well above even its optimal value. b. Market mistakes: Even the firmest believer in efficient markets will concede that markets can make mistakes in assessing and incorporating information into prices. If that occurs, the price can deviate from value, in either direction. c. Market misunderstanding: Some companies are so complex in terms of organizational structure and business mix that even diligent investors may be unable to price them correctly. During periods of crisis, it is not uncommon for investors to reduce what they will pay for these assets, i.e., attach a complexity discount on value. As an individual investor, you or I have little chance of stopping momentum, getting the market to correct its mistakes or clearing up misunderstandings, but activist investors may be able to provide a counterweight to the market. First, they can bring enough resources to bear on the market to shift momentum. Second, the news that a well-known (and savvy) value investor has bought (or sold short) a stock may lead investors to reassess the price and remove or reduce market mistakes. Finally, activist value investors with enough heft may be able to get companies to remove some of the sources of market misunderstanding, pushing for (and getting) companies to spin off or divest non-core assets and increase accounting transparency. As the description should make clear, activist value investing requires significant resources (to acquire large stakes in publicly traded companies) and persistence (it takes time to get management to change its ways). By its very nature, it also requires concentrated portfolios, since you cannot contest managers at dozens of companies at the same time. Most institutional investors are ill suited for activist value investing, since they do not have the time horizon to wait for activism to pay off or the stomach to challenge incumbent managers. It is ironic, therefore, that some of the first attempts at activism in recent decades came from institutional investors like CALPERS, the California Public Employee Pension fund. While activist institutions remain the exception, there are still mutual funds (mostly small) that play the activist game. The early eighties also saw the coming to age of "corporate raiders", who targeted what they saw as bloated corporations and demanded change. That tradition remains alive in the individual activists such as Carl Icahn and Bill Ackmann, among others, who publicly target firms for change. Finally, the last two decades has seen some hedge funds and private equity investors (with KKR and Blackstone being leading examples) that have made activism the centerpiece of their investing strategy, often using leverage as their way of bridging the funding gap. In summary, institutional investors have pushed primarily for changes in corporate governance and seen little payoff to their activism. Individual activists have targeted unprofitable, poor performing companies, agitated for deploying assets to more profitable uses and higher dividends, and the survivors have generated superior returns (though the unsuccessful ones drop out quickly). Hedge fund activists have behaved more like passive value investors in the companies that they target, often fail at getting companies to change and if there are excess returns on average, they accrue to a few investors at the top of the pile. a. Follow the activists: You could invest in companies that have been targeted by activist investors and try to ride their coat tails to higher stock prices. Since the bulk of the excess returns are earned in the days before or on the announcement of activism, there is little to be gained in the short term by investing in a stock, after it has been targeted by activist investors. In the long term, you can perhaps make money by focusing on the right activists, looking for performance cues (improved operations) at the targeted firms and hoping for hostile acquisitions. Overall, though, a strategy of following activist investors is likely to yield modest returns, at best, because you will be getting the scraps from the table. b. Lead the activists: You can try to identify companies that are poorly managed and run, and thus most likely to be targeted by activist investors. 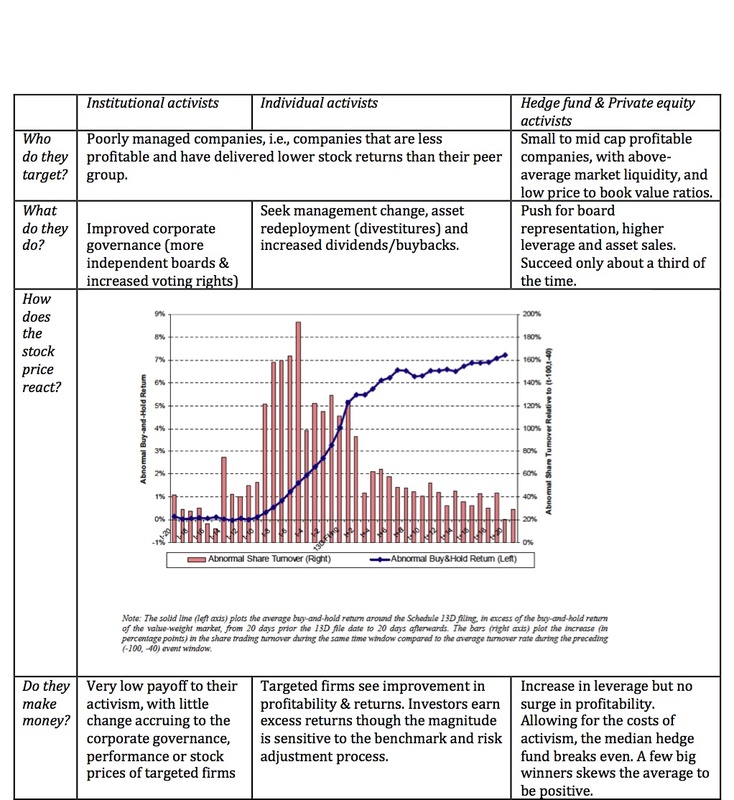 In effect, you are screening firms for low returns on capital, low debt ratios and large cash balances, representing screens for potential value enhancement, and low insider holdings, aging CEOs, corporate scandals and/or shifts in voting rights operating as screens for the management change. The first part should be easy to do but the second part will be more challenging, requiring a mix of quantitative and qualitative assessments. To help on the first, I did a preliminary screening to arrive at a list of 25 companies that trade at less than 8 times EBITDA, have returns on capital <7.5%, book debt to capital ratios <10%, cash as % of value>10% and insider holdings <10%. The rest is up to you! Blog post 1: Value Investing: An Identity Crisis? Is there any way to put a button close to your posts to be able print them? Thanks and I wish all the best. I would be happy if in this valuation serie you made a post about the moat-concept wich have been popularised by Warren Buffet and "frameworked" by MorningStar. Serveral studies have shown that long-term high ROE/ROIC are less subject to a return to the means and can be keep high ROE/ROIC for long time. Thoses companies can maintain a high level of profit because of several moats (network effet, switching cost, etc). An example of this kind of company is CH Robinson. What's your feeling about this specific point? Sounds to me like another screen (quality of growth) to add to your screening process. I agree with those who claim that competitive advantages matter but by itself, it is just a piece in a much larger puzzle. Thanks for the article, interesting stuff. Just out of curiosity, I saw some recent 13-F filings of activist investors investing in 2 interesting companies: Pepsi and Abercrombie. The Pepsi move I understand, separating the snack and beverage businesses. But the Abercrombie investment has me a little more puzzled. Any idea why an activist would be interested in a company such as Abercrombie? If you have any insight please let me know. Hope you have a good one! "Sounds to me like another screen (quality of growth) to add to your screening process." 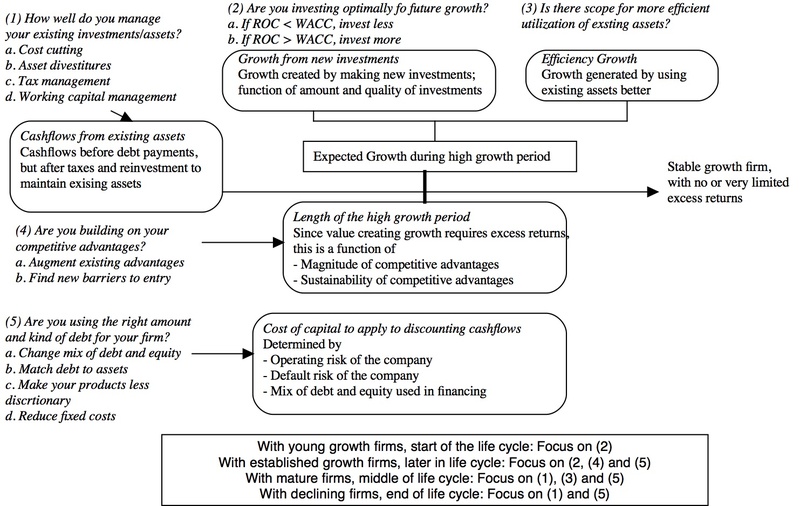 After using the Excel Sheet you provided, screening for high quality of growth seems quite simple in fact. Thank you for all your articles. Thanks for sharing this useful info. Keep updating same way. I would like to talk about an area or situation where value investors need to be much more active in. I do not mean high quality' begins trading at a very low price to sales ratio. Price to sales ratio is the number of shares outstanding multiplied by the price of the shares. For instance take a company thats doing 500 million in annual sales but its market cap is just 50 million. The value of the shares outstanding multiplied by the price is just 50 million dollars. but the company does 500 million in annual sales. In case after case whenever I have owned shares in a company that has a low price to sales ratio. Generally speaking theirs a buyout of the company by private equity another company in a similar business or the family of the company that usually already owns a large amount of the stock to begin with. In any case the acquirer usually pays a very low price for the shares as a matter of fact a unfairly low price for the shares. And for the most part they get away with it. I Once talked to a lawyer that specializes in these kinds of cases he stated that in many cases these deals are unfairly structured in a way to prevent or make it very diffcult for another company to make a better offer to shareholders. What a riot! AND, the Atlantis Sirki quilt your cat is enjoying Atlantis Sirki so much is gorgeously beautiful! This blog is truly awesome in all aspects. Really impressed! Everything is very open and very clear explanation of issues. It contains truly information. Your website is very useful. Thanks for sharing. I’m glad to find so many useful and informative data on your website. Your articles don’t beat around the bushes exact t to the point. Your listing are progressing with days dungeon it up guys. I touch really precise version these articles I stingy there are writers that can create moral stuff. I would be pleased if all WebPages provided such articles. The deep you dig into the subject and give us the accurate data is appreciable. Nice answers in replace of the question with real point of view and explaining about that. These blogs are quite incredible that have provided the best knowledge. I would never like to fail out any chance to read out your listings. Your work forces out your followers for blog commenting. I dead consider blissful once I get articles relatable to my subject. This article is actually remarkable one it helps many new users that desire to read always the best stuff. I suppose this info is completely unique. Exceptional blog you guys have conserved there, I absolutely appraise your effort. Hi, I really need the information more as you have provided in this valuable blog. I really like this great job folks. This stuff is down t earth, hats off buds out there. I am certain this article has touched all the web visitors; it’s very extremely lovely script. Your articles and contents are inspirational. Really advisory and effective assemblage. auto insurance I have got the superb information from these blogs finally. These all instructions will help me in investing my business. I’m in a partnership business and hopefully these tips will work effectively. I like your site its quite informative and i would like to come here again as i get some time from my studies. i would like to invite my other friends to this site, as you have done a great job.i must say...keep it up guys.. Your articles are more than wow! You posting are wonderful and informative. An unbelievable blog. This blog will indisputably be definitely recommended to my friends as well..
Info is out of this world, I would love to read more. This is actually a fantastic blogs! More of these details are superb -it is nice to see one that current. I was searching for decisive information on this topic. The information you have provided in the blog is really important. It feels good to feature much enlightening and unique articles on your websites. I get pleasure from reading and revalue your changes. You guys allow it to be quite simple for all your folks available. The blog is quite awesome that has provided me the best knowledge. Thanks for compiling such nicest information in your blogs. Articles are very informative and hope again I’ll find more like that. Thanks for amassing such nicest information in your blogs. Articles are very informative and hope afresh I’ll find more like that. I am really appreciating very much by seeing your interesting posts. Value Investing: Where is the beef? Value Investing: An Identity Crisis?